WASHINGTON, D.C. -- Bachelor's degrees are still more common in the U.S. than associate degrees, but the typically less expensive two-year degrees have become increasingly popular in the past decade as college costs have skyrocketed. 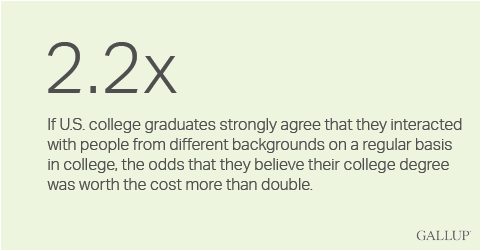 A new Gallup-USA Funds study of associate degree holders finds that many of those who received these degrees strongly believe they were worth the cost (46%) and were essential to achieving their career goals (41%). But at the same time, associate degree holders trail bachelor's degree holders in several key aspects of their lives. My education from [institution] was worth the cost. These findings are among those featured in the new Gallup-USA Funds Associate Degree Graduates Report. This report draws from two studies using U.S. adults recruited from Gallup's Daily tracking survey: 1) a Web survey conducted with a random sample of 2,548 U.S. adults with Internet access who have an associate degree as their highest level of education and 2) the national Gallup-Purdue Index conducted with a random sample of 30,151 U.S. adults with Internet access who have a bachelor's degree as their highest level of education. As college costs have soared in the current economic climate, associate degrees have become increasingly appealing for many students because they can complete these degrees in less time and at a lower cost than a four-year degree. According to the National Center for Education Statistics, the number of associate degrees awarded increased by 59% from 2002-03 to 2012-13, from 634,000 to more than 1 million. Over the same period, the number of bachelor's degrees rose by 36%, from 1.3 million to 1.8 million. Those who receive an associate degree alone still earn less today on average than do those who receive at least a bachelor's degree, and associate degree holders are also more likely to be unemployed. In addition to the value that more education brings to an individual over his or her lifetime, these differences could reflect other factors, including the background characteristics, intrinsic motivations, quality of early education and family background differences of those who elect to get a bachelor's degree versus those who elect to get an associate degree alone. Still, those with an associate degree may be better off than those with a lower level of education such as a high school diploma; but these data are not available for comparison at this time. Overall, most associate degree holders in the study are working in some capacity, and the majority are currently working full time for either an employer or themselves. But associate degree holders (49%) are less likely than bachelor's degree holders (56%) to be currently working full time for an employer. Despite these differences, employed associate degree holders do fare slightly better than employed bachelor's degree holders on a couple of measures of connectedness to their job. They are slightly more likely than those with bachelor's degrees to strongly agree that they are deeply interested in the work they do and to feel that their job is ideal for them. About four in 10 employed associate degree holders strongly agree that they are deeply interested in the work they do, while fewer (29%) strongly agree that their job is ideal for them. I am deeply interested in the work that I do. My job gives me the opportunity to do work that interests me. I have the ideal job for me. Gallup defines a "good job" as working full time for an employer and finds that having this arrangement strongly relates to higher well-being. It is not too surprising, then, that associate degree holders -- with their lower full-time employment rate -- also lag behind their bachelor's degree-holding peers in well-being. Associate degree holders are less likely than bachelor's degree holders to be thriving -- consistent, strong and progressing -- in each of the five areas of well-being that Gallup measures. The largest gap in well-being between associate degree holders and those with bachelor's degrees is in their financial well-being. Slightly more than one in four (27%) associate degree holders are thriving in this area -- which means they are effectively managing financial stress and their economic life -- compared with 41% of those whose highest level of education is a bachelor's degree. This gap at least partly reflects the gap in the personal income levels of these two groups: The majority of bachelor's degree holders in the study individually make at least $48,000 annually, compared with about one-third of associate degree holders. Given the rising number of associate degrees awarded in the U.S., it is important to study these graduates' long-term outcomes at work and in life. While associate degree holders lag behind their peers with bachelor's degrees in all areas of well-being and in having "good jobs," those with associate degrees (46%) are still just as likely as those with bachelor's degrees (45%) to strongly agree that their education was worth the cost. Further, almost as many associate degree holders strongly agree that obtaining their degree was essential to achieving their career goals. Although they may be satisfied now, some of these associate degree holders will likely end up back in the classroom in the future. More than four in 10 associate degree holders (41%) strongly agree that they will need to earn a higher degree to advance in their career. Educational institutions seeking to attract these associate degree holders will need to be somewhat flexible and work with prospective students to overcome the perceived financial barriers and work and family obligations that might stand in the way of their obtaining a more advanced degree. Results represent data collected via two distinct studies, including a study of associate degree holders and the national Gallup-Purdue Index study of bachelor's degree holders. The study was conducted March 19-May 11, 2015, with a random sample of 2,548 individuals with an associate degree as their highest level of education, aged 18 and older, with Internet access, living in all 50 U.S. states and the District of Columbia. The national Gallup-Purdue Index was conducted Dec. 16, 2014-June 29, 2015, with a random sample of 30,151 respondents with a bachelor's degree as their highest level of education, aged 18 and older, with Internet access, living in all 50 U.S. states and the District of Columbia. Samples for these studies were recruited from the Gallup Daily tracking survey. The Gallup Daily tracking survey sample includes national adults with a minimum quota of 50% cellphone respondents and 50% landline respondents, with additional minimum quotas by time zone within region. Landline and cellular telephone numbers are selected using random-digit-dial methods. Landline respondents are chosen at random within each household on the basis of which member had the most recent birthday. Gallup Daily tracking respondents with a college degree who agreed to future contact were invited to take the surveys online. Interviews were conducted via the Web, in English only. Samples are weighted to correct for unequal selection probability and nonresponse. The data are weighted to match national demographics of gender, age, race, Hispanic ethnicity, education and region. Demographic weighting targets are based on the most recent Current Population Survey figures for the aged 18 and older population with a U.S. bachelor's degree or higher. For results based on the total sample of those with a bachelor's degree, the margin of sampling error is ±1.0 percentage point at the 95% confidence level. For results based on the total sample of those with an associate degree, the margin of sampling error is ±2.6 percentage points at the 95% confidence level. A new Gallup-USA Funds report reveals that black graduates of Historically Black Colleges and Universities in the U.S. are more likely than black graduates of other institutions to be thriving in a number of areas of their lives.